My backyard is somewhat neglected. Between work and school, it has been hard to find time for yard work. But now that it's warming up, my wife and I have made it a serious goal to get our yards in order. This last weekend was focused on the backyard, particularly the flower bed and grapevines. There are a few flower beds around my house. The front bed is not near as bad as the back. Probably because I tend to give the front yard a little bit more attention than the back, because people actually see the front. The front flower bed gets a few different kinds of weeds, but mostly just really fast growing grass. Any idea what these are called?? Obviously the front yard needs a lot of work and some serious TLC. I did mow and edge the lawn for the first time this year which made a huge difference. But, it's still far from being done. As much as I wanted to tackle both lawns, my Saturday was filled with all kinds of family get-togethers and other pressing appointments. So I did not have much time to spend on the barren wasteland I call my lawn. Like I said, my priorities were the grapevines and the back flower bed. My wife was getting tired of the frightening view of the backyard which is seen from both the kitchen and our Master Bedroom. It was definitely time to trim those haunted-looking grapevines. So I trimmed the crap out of those babies, and moved onto the dreaded flower bed of doom. I've cleared this flower bed once before. Spent hours on getting rid of all the blasted weeds. And yet, somehow, they keep coming back. Flower beds and things of that nature really do require constant care and maintenance. I am going to try to make weed-pulling a weekly routine in every area of my yard. It really is the only way to stay on top of it all. If I had more time during the week, I'd dedicate a weekday to yard care and garden maintenance. But for now, Saturdays will have to do. 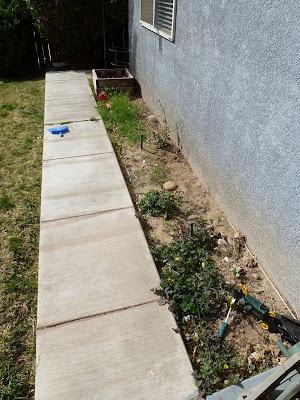 Looking at an over-run flower bed can be a little depressing. All the weeds and junk that builds up in these beds is amazing. BUT! Do not fear, preparing a flower bed for future generations of plant-life is a rewarding and [with the right attitude] enjoyable project. I started by picking the tall and medium weeds by hand. I got down on my hands and knees and pulled each weed, one by one. 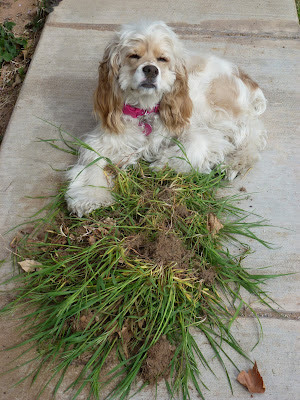 I always try to get as much of the roots as possible, though, a lot of what infiltrates my garden beds is Bermuda Grass and if you know anything about Bermuda Grass, it's that the roots go all the way down to hell so it's nearly impossible to pull them up entirely. I'm pretty sure the only realistic way to get rid of Bermuda is to poison it to death with some powerful chemicals. If you know of any other alternatives, I'm all ears. I actually enjoy pulling weeds by hand. Most the time I pop in my headphones and zone out. This time, however, I was enjoying the stillness of the day. It was over-cast, and Annabelle was keeping me company. I couldn't listen to music because she insisted on conversation.. so I obliged. Once I was done pulling weeds by hand, it was time to bust out the hoe. The soil in this flower bed was like concrete, I'm not kiddin yuh. I did what I could to loosen it up with the hoe, but it wasn't enough. 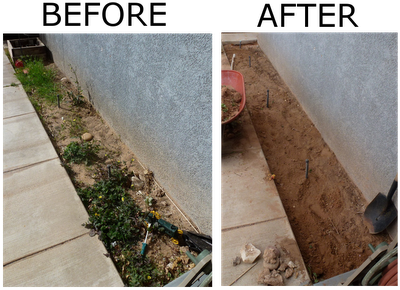 I took a shovel and turned over a section at a time, slowly, watching for more weeds and root clumps. I took it a step further and started shoveling bigger sections into a wheelbarrow. 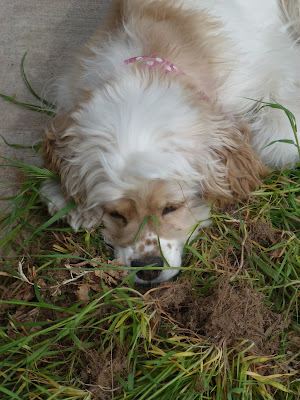 I'd sift through a large section of the soil, removing rocks, weeds, and so on and also doing my best to make the soil as loose and fluffy as possible. I'd then return the soil back to flower bed. 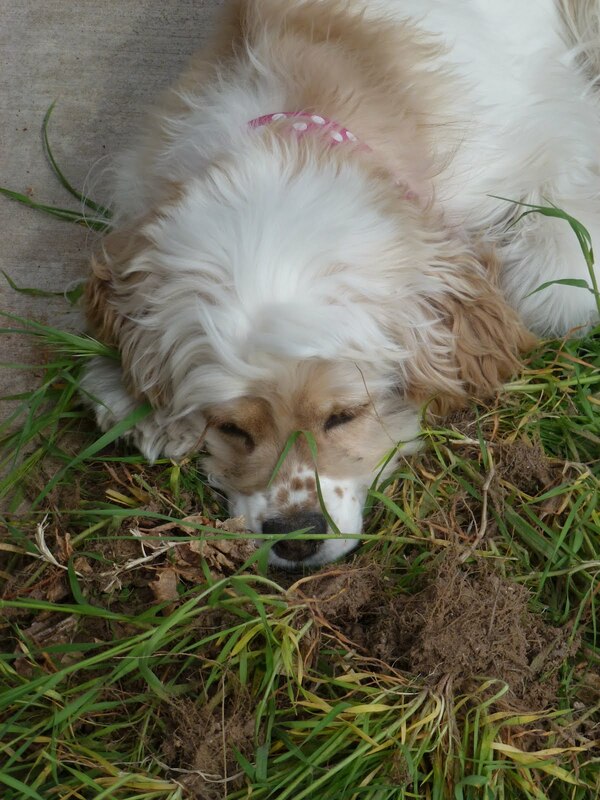 By this time, Annabelle was ready for a nap. It took 4 wheelbarrow loads before the soil was almost totally weed-free and loose enough that I could run my fingers through it. I think you were dead on about them being Alyssums. Thanks! :) I really appreciate that. I'll keep them around.